In patients with chronic heart failure (CHF), comorbidity of airflow limitation is associated with poor outcomes. The forced expiratory volume in 1 s (FEV1) is used to evaluate the severity of airflow limitation. However, the impact of FEV1 severity on prognosis has only been partially elucidated in patients with CHF. In total, 248 consecutive patients with CHF who successfully fulfilled spirometric measurement criteria were enrolled and prospectively followed. Percent predicted FEV1 (FEV1%predicted) was associated with the New York Heart Association Functional Classification. FEV1%predicted was significantly associated with diastolic dysfunction, evaluated using echocardiography; elevated inflammation markers; and increased pulmonary arterial pressure. There were 60 cardiac events, including 9 cardiac-related deaths and 51 re-hospitalizations due to the exacerbation of CHF during a follow-up period. Kaplan–Meier analysis revealed that the lowest FEV1%predicted group had the highest event rate, irrespective of the presence of smoking history. Multivariate Cox proportional hazard analysis showed that FEV1%predicted was an independent predictor of cardiac events after adjusting for confounders. 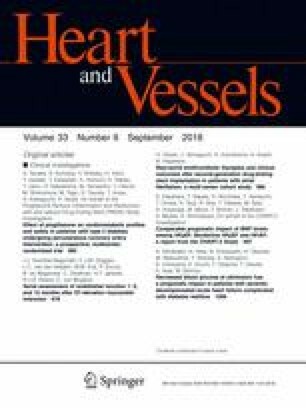 The net reclassification improvement and integrated discrimination improvement were improved by the addition of FEV1%predicted to other cardiac risk factors. Decreased FEV1%predicted was independently associated with the poor cardiac outcomes in patients with CHF.